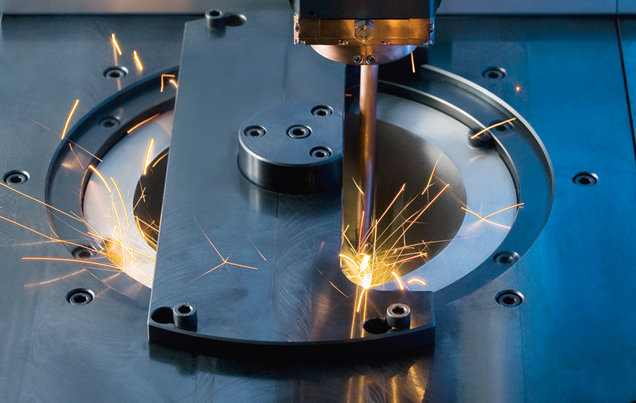 Laser welding is a precondition for compact, weight-optimised components and thus for energy- efficient vehicles. Adjustable doses of concentrated laser beam energy allow for high welding speeds and ensure component warpage is kept to a minimum. The relevant component parts can thus be finish-machined cost-efficiently and then welded – heading for the assembly line without needing further work. It is inconceivable that a modern vehicle can be manufactured without laser welding as part of the production process. EMAG ELC laser welding systems are compact laser machine tools that can be configured – on the basis of standardised platforms and their relevant modules – to form user-, project- and component-specific manufacturing systems for laser welding. EMAG ELC laser welding systems were – without any compromise – developed and optimised for the production laser welding of high-quality components. The flexibility of the laser welding process allows for the creation of new component designs, with the joining and laser welding of cast materials and case hardening steels, for instance, being trouble-free. High processing speeds and accurate reproducibility make laser welding the ideal process for the batch production of precision components for the powertrain and chassis of modern vehicles. Transmission manufacture can no longer do without the high-tech production process Laser Welding. For instance, the joining of control gear and clutch body, using the laser welding process, forms the basis for more compact, more efficient gearboxes. Modern laser beam sources in conjunction with optimised workholding technology ensure that laser welding leads to only the absolute minimum of material distortion – a precondition for quiet gears and easy gear changes. In practice, the EMAG LaserCell presses the clutch body onto the control gear and then laser welds them. This example shows how efficient, highly productive and precise the laser welding process is. Laser welding – as EMAG understands it – is, above all, an economical manufacturing process, where the key technologies are automation, clamping and laser welding.